Save the date—speaker submissions are now open for spring/summer 2017 Predictive Analytics World events. Share how predictive analytics impacts your organization at the leading cross-vendor event for predictive analytics professionals, managers and commercial practitioners. 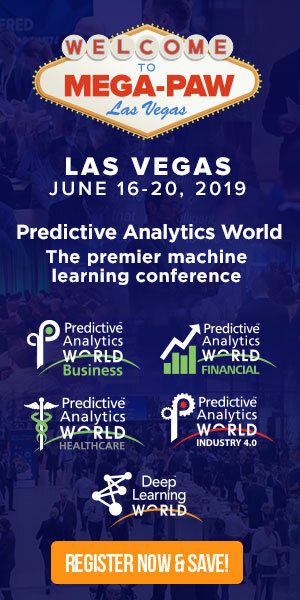 As a speaker, you’ll be recognized as an expert in the field, and you’ll receive a complimentary registration to the Predictive Analytics World event that you speak at. Possible speaker topics include advanced methods, analytics project management, credit scoring, fraud detection, insurance applications, marketing analytics, online marketing optimization, predictive resource allocation, response modeling, sales forecasting, uplift modeling and more. Event dates and submission deadlines are below. Inspire fellow predictive analytics practitioners and thought leaders. Click for more information and to apply to speak at the spring/summer Predictive Analytics World conferences.